FineDine Stainless Steel Mixing Bowls with Plastic Lids As a family run company that knows the importance of sitting down together at a dinner table, we at FineDine hold a very high standard for kitchenwares. Our company develops high quality glassware, serveware, and kitchen tools that not only look great, but make the cooking and serving experience all the more pleasurable. These bowls encompass our mission and are sure to be your favorite kitchen bowls! 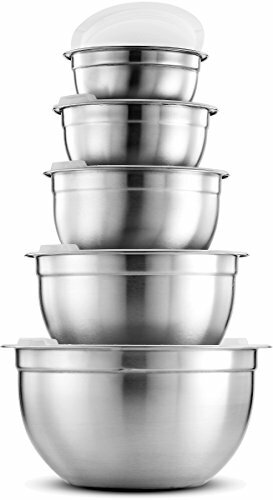 Set of 5 premium quality stainless steel bowls and plastic lids for ultimate food storage, baking and cooking preparation. These brushed metal nesting bowls come in sizes .75, 1, 1.5, 3, and 5 quarts. Wide, flat rim ensures a sturdy grip for pouring, mixing, whisking, meal preparation, and serving! Deeper than standard bowl sets, our stainless bowls allow for larger servings and less mess! The small metal bowls are great for whisking and beating smaller quantities, while the large metal bowls are ideal for mixing large batters, tossing salads,marinating and storing. The lids are made of translucent HDPE plastic; a flexible bpa-free material that won't leach toxins. Each lid fits flush inside their serving bowl for a snug fit and have a recessed top for mixing bowl stacking. Easily remove and replace the lids with conveniently placed handles. Made of heavy gauge stainless steel, these dent and rust resistant mixing bowl set are sanitary; never retaining odors, bacteria, or stains. The silver bowls feature a shiny interior and fingerprint-proof satin exterior, a wide flat rim for smooth pouring, and a flat base for stability. Our refrigerator and freezer safe kitchen bowls and lids are simple to clean by hand (lids must be handwashed) Bowls are dishwasher safe! The metal bowls ship in secure packaging perfect for gifting to loved ones on special occasions.